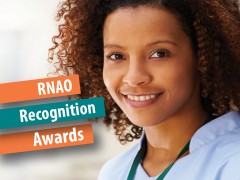 Celebrate the best in nursing this year by nominating* a colleague or your organization for one of RNAO's prestigious Recognition Awards. The awards are divided into five categories: leadership, education/mentorship, group, undergraduate student, and member of the public. awards foster excellence in nursing, promote the profession to the public and recognize exceptional colleagues. Winners will be recognized at the RNAO Annual General Meeting on April 20, 2018. If you have questions about the awards or nomination process, please contact Patti Hogg at 1-800-268-7199, ext. 220. *You must be logged into your MyRNAO account to submit a nomination form.